The following sequence of images of M82 were taken by Peter Branson between January and June 2014. They show the development of the supernova that erupted in M82 on January 22nd 2014. The first image shows the galaxy prior to the supernova going off, while the others show its development and dimming over time. You will have to scroll to the right to see them all! The supernova is the right-hand star of a pair of stars in the bottom half of the galaxy. Another closeup with the supernova labelled is shown further down the page. The images were taken using a Canon 1100D camera attached to a TS Photoline ED102 refractor telescope with field-flattener and Hutech IDAS light pollution filter attached. The telescope was guided using an Orion Mini autoguider controlled by PHD software. 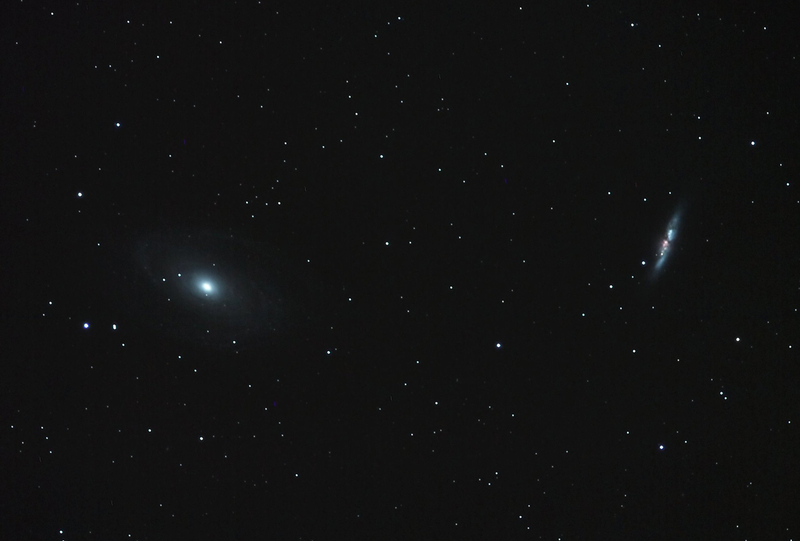 Peter Branson took this image of M82 (right) and M81 (left) on the 26th March 2014. The image is a stacked composite of 26 individual frames each of 120 seconds exposure at ISO 1600. They were taken with a Canon 1100D camera attached to a TS Photoline ED102 refractor telescope with field-flattener and Hutech IDAS light pollution filter attached. The telescope was guided using an Orion Mini autoguider controlled by PHD software. The separate images were stacked in Deep Sky Stacker and the final image was further processed in Gimpshop. 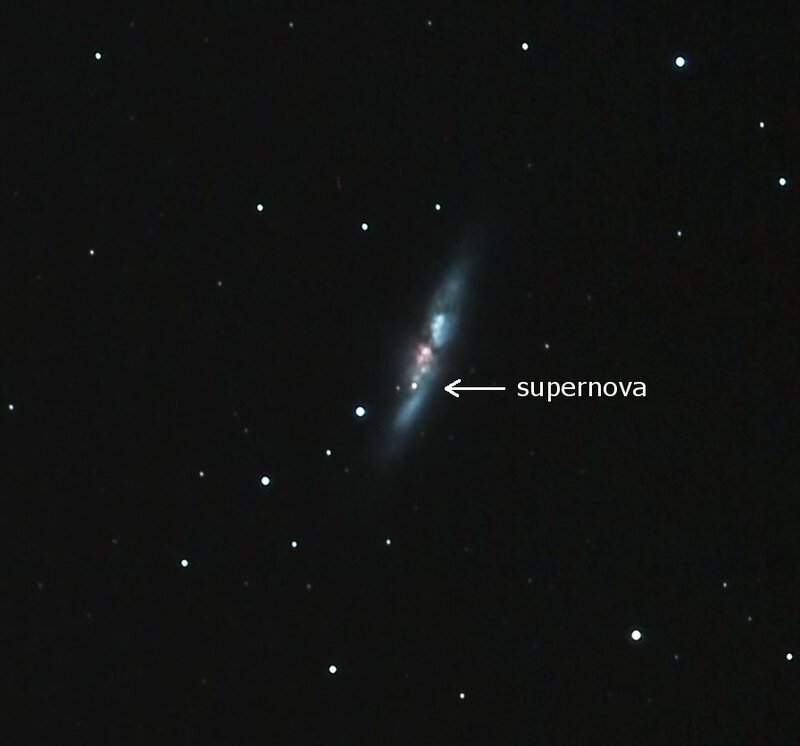 The supernova that erupted in M82 in January 2014 is visible in the image, and labelled in the close up shown below the main image. 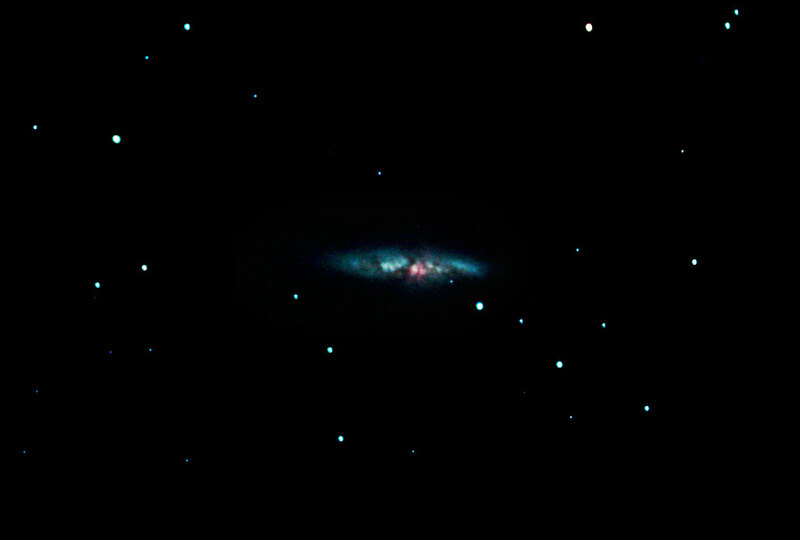 The irregular galaxy M82 (NGC 3034) lies to the right of this image by Adrian Brown, which also shows the spiral galaxy M81 (NGC 3031) to the left. M81's faint satellite galaxy Holmberg IX is visible above M81 itself. 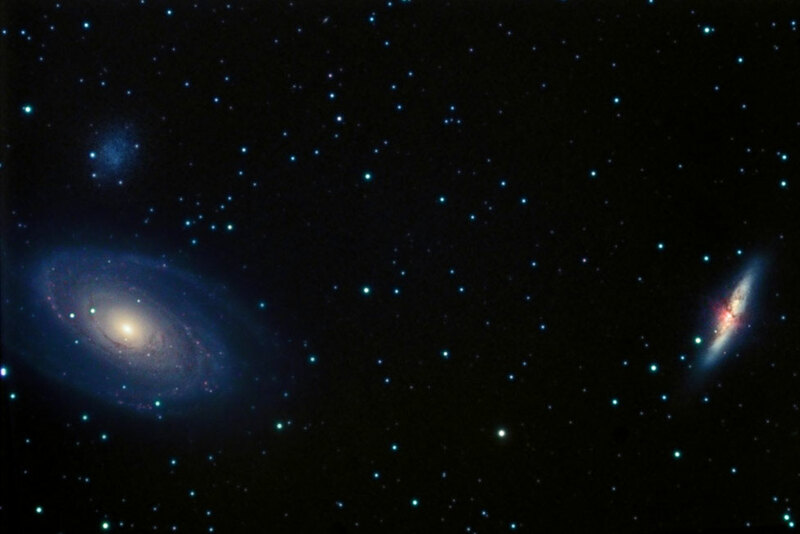 Adrian photographed these galaxies with his Skywatcher 80ED refractor and an ATK16HR camera. The data was collected on the evenings of the 1st and 4th March 2006 and consists of 1.5 hours luminance (5 minute sub exposures) and 30 minutes (3 minute sub exposures) each through RGB filters. The digital development process (DDP) filter in Maxim DL was used to bring out detail in the galaxy cores and this detail was then sharpened via the application of a high-pass filter in Adobe Photoshop. Chris Newsome and Adrian Brown captured the following image of M82 on the 19th February 2006. They used a Canon EOS300D camera at 400 ASA through Adrian's Celestron C11 fitted with a f/6.3 focal reducer, mounted on a CGE mount and guided using Guidedog software with focusing using DSLRFocus. An Astronomik CLS filter was also used to remove sodium light. Five images were taken at 210 seconds exposure and calibrated in Maxim DL. The resulting image was then processed in CS2 using RGB levels, curves, GradientXTerminator and a highpass filter.